Appearance: Djinn is one of few cats who is completely black. There is not a single part of his fur that is any other color, apart from his eyes which are yellow. His chest, his muzzle, his paws, all the same pitch black as the majority of his body. It's a rare occasion but it actually helps him with sneaking around. He wears absolutely nothing, not even an attempt to pass as an owned pet. Personality: He was a little distrustful of people, however recently he discovered the benefits of being a pet. A former stray who lived his whole life in the (lol) underground of Richardson Valley. He met Pyxis and after helping defend him from a stray dog he ended up living with Pyxis' family. He still needs to learn a little bit about manners and what is considered civilized but he is making progress. Undiscovered fact at this point, he is illiterate. How does RG have 5 spots open with 19 pets, while RA has 2 spots open with 17 pets? Or is it counted by the player? That makes much more sense, as RA has 13 players, RG has 10 players and RV has 15 players. Appearance: She often has a smirk to her mouth, and a sly look to her eyes. She's usually very relaxed and her stretching can make her seem taller than she is. She is in very good shape, exercising every day. She has green eyes and wears a yellow collar with a brown nut tag. Personality: Hazel is the pranking type. She likes to play tricks on others, and is almost always laid-back and lazy, enjoying simple pleasures (when she isn't pranking someone). But she has a good heart and believes in standing up for what's right, which means protecting those smaller or weaker than she is. She will only prank someone who will either appreciate it or else who deserves it, and she always waits for them to make the first move. Other Notes: In her old neighborhood she was part of a gang called The Flying Felines. She'd gotten into it because she thought it was a way to have fun with her friends, but eventually they got into trouble with the law, doing illegal pranks that went too far, even on targets who didn't deserve it. For this reason she defected even before moving to Richmond Acres with her owner, although she still keeps in touch with the leader of the gang, a tomcat named Rock Band. They used to be an item, but are not anymore--although they are still friends. Last edited by ChewyChewy on Mon May 31, 2010 8:59 pm, edited 1 time in total. Personality: Ember is a happy, bubbly type of person. She can be carefree and cheery almost everyday. Though she can be as short tempered but usually forgets about her problems and sees the positive side of life. She also loves to go shopping which is her favorite hobby. Other Notes: Ember used to live in a different village with her own feline parents. But they were separated after a huge war in her hometown. She was just a little kitten when her parents had only left her and did not brought her along with them. Her world was alone, scared, and filled with darkness. Ember traveled and traveled until she stopped near a house and began to cry. One of the owners of the house found her and decided to take care of her. They pampered her many times and took her shopping that's how she became a fashion addict. Now that she has found a new family, her life was filled with light and happiness. It seemed that she'd never been this happy before in her life. Last edited by SweetCupcakeCat on Fri May 28, 2010 9:52 pm, edited 3 times in total. Lets have him answer it. Waitwaitwaitwait, no there are no spots left for RA, yes it is counted by player not characters, annnd there are only spots open in RG. Sorry man, try there. CUPCAKECAT, SORRY IT TOOK SO LONG TO GET TO YOU. First on the list... "Age: One human year (3.5 pet years)" she would be a kitten, like, a kid, hardly old enough to experience what she has. I would suggest at least three or four human years. ALSO... nothing else. alright you probably know everything else. if you have any questions, just ask and I'll see if I can find/remember it. It seems we need a new neighborhood. Ladies and gentlemen, let the naming begin! There is one condition: it can't start with "R." We have enough "R's!" Brook Meadows sounds like a wonderful name too. Brook Meadows is a nice name. ... well I coincidentally thought of a name kind of similar to the one already suggested before seeing it, but thought I would throw it out there anyways. Here's my other mains in Richmont Acres. Bianca, unlike most Bombay cats, has completely white fur. This is because she is an albino. Her fur is shorter than a longhair, and longer than a shorthair. She keeps very good care of her fur. Her eyes are a deep azure. She wears a light blue collar that’s nearly white. Her tag is a white rose. Bianca is a very quiet cat. She used to have an abusive owner, so she eventually became overly polite and timid. On a positive note, she also became selfless, and happily gives what she has. Because of her timid nature, it takes a while for her to become comfortable with others, but she eventually warms up to others. Bianca was born in a very nice breeding center. She was doted upon and spoiled as a kitten. When she became one years old, old enough to be adopted, an elderly man adopted her. The elderly man cared for her wonderfully for about a year until he died. He left his estate to his only son, and his estate included Bianca, at the age of two. The son was a horrible owner. He would hit her, yell at her, and barely feed her. After two and a half years of this, their neighbor found out about this and called the ASPCA. They arrested the man and took Bianca to an animal shelter. She spend a half year in the animal shelter, recuperating before getting adopted by Mr. Hunter. Her first owner, the old man, taught her to play the violin. Mr. Hunter bought her one so she could play. She has an Italian accent. Strength- 4 "U-um, I-I'm sorry I can't help..."
Perception- 6 *Hears small noise in distance* "What was that?" Endurance- 6 "I-I, w-well, I-I can take a hit..."
Charisma- 3 "Oh, u-um... H-Hi..."
Intelligence- 7 "Books a-are very nice." Agility- 8 "I-I've had experience running a-away from things..."
Luck- 8 "M-My luck has been looking up ever since I moved here." Ginger is an orange cat with dark orange stripes. She was green eyes. She has a red collar, and the tag is a hollow circle. Ginger is a very motherly cat. She is very protective of her friends, and loves to take care of them. But she's motherly in the other sense as well, meaning that she'll kick some serious tail if you threaten or harm her friends. She means well though. Ginger was a stray since birth until she went to the pound. She was cage-neighbors to Bianca for the past year. Ginger acts like an older sister to Bianca. Bianca and Ginger were adopted on the same day, and both of their new owners live in Richmond Acres. Her new owner, Veronica Alexander, has a lot of land with some sheep. She's allowed to come indoors, but she chooses to sleep in the barn with Duke. She can play the trumpet pretty well. Last edited by ctcmjh on Sat Jul 03, 2010 11:02 pm, edited 6 times in total. I'm considering making another main, myself. A male cat. Appearance - Pretty much a large, gray, North American Raccoon. Only interesting feature is an old scar on his upper left leg. He looks a little older than he is, because he grew up in the harsh wild and still lives in the wilderness, and has been in alot of bad situations. He walks with a wide-stance, which might tip off any character with fighting experience that he is a skilled brawler. He usually wears a ranger-green collar with a ranger-badge styled tag, and has a walkie-talkie clipped to it when "on duty". Personality - Rikki is extremely mature for a "pet", but can also be a bit of a wild trickster. Having been born in the wild and never really domesticated, he has a tendency to act undomesticated at times. One thing he does is he tries to get close to people fast, and when he's close, he's sure to show all his affection, often physically, because he grew up with the reality that every time he saw a friend might be the last. Rikki also has a tendency to fall back into certain habits, such as his paternal instinct with children. He also likes to wax philosophical. Other Notes - Adopted "pet" of Ranger Jack Calvin. - Has a litter of 3 children who turned 4 in the spring. - Currently learning to read and write, after seeing Kyra read long books. Physical - Hardened - Rikki is strong, agile, and tough skinned from growing up in the wild. He has alot of experience when it comes to acrobatics and combat, and can be quite quick, though his leg injury does slow him down. Social - Witty - Rikki is witty, empathetic, and somewhat kind. He has a very clear air of the wild around him, which may end up rubbing off on others, or causing them to be unnerved by his presence. Rikki has some negotiation abilities, but may still come off as unsure when it comes to situations which he finds very human-oriented. Special - Mystical - Rikki has some knowledge of the paranormal and forest-lore, as well as some minor supernatural endowments. Rikki has also been given some training in police tactics and firearms. 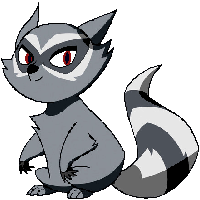 Strength: Rikki has grown up in the wild, and is thus an extremely skilled fighter and suvivalist. He is most importantly capable of taking down larger, stronger opponents, including wolves. Weakness: Rikki very ignorant of the human world and semi-illiterate, having grown up in the wild and not as a pet. This makes it hard for him to relate to pets and humans. He also has trouble suppressing his feral tendencies. Strength: Rikki is very mature and wizened, having raised three children and lived a long life in the wild. Weakness: He sees himself as equal to humans: Jack is NOT his owner, but his close friend. This means he mentally clashes with the status quo. Neutral: Rikki is a wild raccoon, and is thus, nocturnal: he goes to sleep around dawn and wakes up in the afternoon. Other: "Old" is a title given to Old Kinut because he is an "elder", meaning he is a wild animal who survived long enough to see his children's children and completed some ritual. He is extremely wizened in just about everything. Location: Killed by poachers when Rikki was 5, enshrined in the middle of the forest. Taku, his son, lives in the forest and has his own character sheet HERE. Last edited by RockstarRaccoon on Mon Apr 09, 2012 5:20 am, edited 29 times in total. Appearance - Pretty much a large, Gray and brown, North American Raccoon. Only interesting feature is an old scar on his upper left leg. Is he going into Radiant Gardens, or are you waiting for the next neighborhood? Sorry, forgot you guys aren't in on the IRC stuff. Next neighborhood. Edit: also, I made an edit. Yes, Bianca's mine. It must have just been a typo. That is pretty funny how all the cats are girls! As you wrote ChewyChewy, Slumber Party! Perfectly understandable, don't worry about it! Well, you don't have to read all of it. Just like when you move into a new neighborhood in real life, you don't have to read 83 pages of what happened in real life. We can sum it up for you if you want. That'd be nice, but can you wait 'till after I think of a character. We're out of player spots, but I know The Game still has a character spot left, actulaly quite a few do. I would like to change the slot system rules. Now, when a neighborhood hits the maximum filled slots, they can vote whether or not they want to add another one, subsequent new slots can be voted on either at that time or after the new slot has been filled. Last edited by ArgentFlame on Sat May 29, 2010 8:49 pm, edited 1 time in total.